Andrew’s thoughts: This is about as even as a trade gets. Two young guys with as much upside as injury risk. I like Devon Travis a bit more personally, just because he’s got a better MLB track record and, well, because I got 16 starts of 6.69 Pt/G out of him last year for the low, low cost of some FAAB. Never forget. Basically even money here; one team that wanted a pitcher gets a pitcher, and one team that wanted a 2B gets a 2B. This is exactly the type of trade this league needed to get the hot stove firing. Hustle’s toxic $0.02: The trade seems fair enough. Long Ball now has Dynasty Grinders legend Devon Travis as his third 2nd basemen after Dee Gordon and Jose Ramirez, which doesn’t make a ton of sense unless you’re trading one away. Still makes more sense than paying double digit cash for him (on top of his salary) and dropping him a month into the season though. Hydra picks up Tyler Skaggs, who is an interesting gamble at $9. The winner of this trade will pretty obviously come down to which of these guys have a better year, assuming they both get kept. The only losers are those that are reviewing it. Oh look, the commissioners trade with each other again, and only a few days before the one year anniversary of the infamous James Shields trade. Truth be told, the trade is very similar in structure. Two upgraded picks for a player. The picks are worse this time. That being said I love this trade for Bailey. He has a glut of 2b in Devon Travis (hey Dusty), Neil Walker (who Jordan traded to Bailey), Marwin Gonzeles, and Chris Owings. Also, he has Ian Happ in his minors that he could call up at any moment. Basically, there’s no way he’s going to remotely miss Jed Lowrie. Jed Lowrie is 33, playing in Oakland, very injury prone, and currently over performing. He’s over 6 points per game at the moment, which is very good for any player and even better for a 2b. Generally I think Jed Lowrie is an underrated player in this format when healthy and has a clear role, but he’s nothing special. When you’re owning Darwin Barney, I think you probably need to make a move for some middle infield depth or be more aggressive on the wire. That being said, I think two 2nd rounders is a pretty steep price for Lowrie. Does Bailey actually say no to one 2nd rounder with that depth? Did he? I’d say it would be pretty irresponsible to say no to 1 for him unless he was confident he could milk 2 (which he did). I get Jordan hating prospects and picks, but a 2nd rounder was selling for 5-7 bucks last year. I can’t get behind selling 2 of them for Lowrie. As our minor league player pool shallows out with getting 5 spots a year, the upper round picks in theory should be worth more. I also think Jordan could have used the other 2nd rounder as a trade chip in a different more impactful deal down the line. Now we probably see Bailey use Jordan’s pick somehow. I’d be pretty surprised if Lowrie moved the needle for Jordan this season, but if it does, it’s worth it. Jordan’s thoughts: My initial reaction was praise towards this deal for Dusty. I like what he’s doing here. Get two keepable players, only shell out some auction cash that is potentially not valuable. Breaking this down for Long Ball to LF. You’re cutting Keuchel most likely. He was not quite elite last year, and while a bounce back is possible, its not probable. If you have to cut someone, he’s easier to manage. Devon Travis was hurt last year, and while quite keepable at $11, there was at least a decision to be made. But, now with an offer of $30 which is unheard of in this league so far, this was an easy trigger to pull. Long Ball turns nothing into another decent player. Back to Rocky Mountain. I still understand what’s going on. He is still going into the draft, having essentially spent $110 on two reasonably good players that he gets to keep going forward for less. Was that available in the draft anyway? Possibly. Could Dusty have done better? Possibly. I think my biggest concern is the price paid, but it could be reasonable. If you like Keuchel and Travis going into 2017 I can like this trade. Andrew’s thoughts: Keuchel was 100% getting cut. Travis is good (.349 wOBA over his first 670 PAs), young, and cheap. Spending auction budget on Travis is fine. Thirty bucks seems steep though and my impression was that Keuchel could have been had for next to nothing. So I guess I would hope he was just a random throw in here that Dusty plans to cut, but at least now he’s guaranteed his availability at auction. 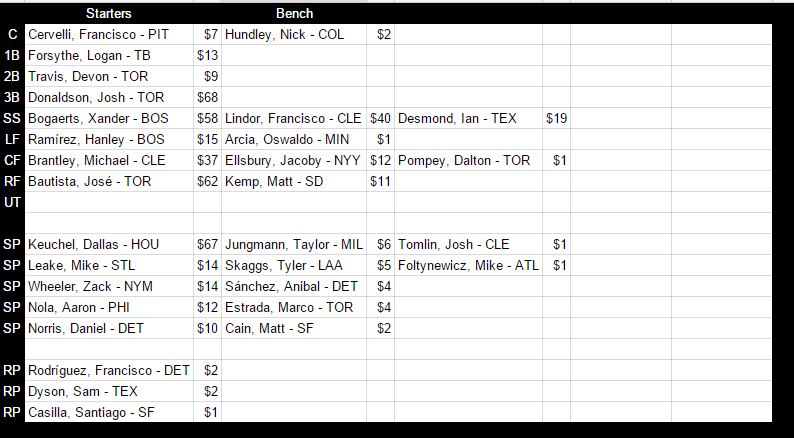 Like, how much of the $30 was allocated for Travis and how much for Keuchel? Does it even really matter? I feel like $10-15 is more than generous for Travis. Buying him sort of acts like a front-loaded deal, where after this season you just have Travis starting at $13. Also, Travis has been in the majors for two seasons and has been hurt in both. It’s not like he’s a sure thing. With $41 ($30 + his $11 salary) you might be able to buy two or even three similar gambles at auction and hedge a little. Long Ball lost a good talent but is in a much better keeper/auction position now. Dusty went from having more auction budget than almost every team to having very little to spend. Even if the pool does end up being rough, it feels like a sudden panicked shift in game plan given recent — like for instance the seeming salary dump of Jake Arrieta. Weeee!